It is hard to believe that the APEX 5 expedition has now come to an end. The journey began for us almost 3 years ago, and since arriving on the 19th of June, we have really enjoyed sharing the experience with our team. Whilst the change of location to Huayna Potosi was a mere bump in the road, we were really impressed with how our team rallied together and made our new home at the Refugio a great place to stay. There have been many challenges along the way, but the expedition was an overwhelming success. The committee admired the extent to which the volunteers became involved in our research. All who were interested were offered the chance to develop their scientific skills in our "pop-up" laboratory, with many people really enjoying the experience! It is not often you get to perform laboratory science at 4800m! Friday was the day that we left our base at Hostal Republica and ascended to the Refugio at Huanya Potosi (4,800m). After a lengthy period of sorting out our kit and packing it into the bus(! ), we set off for Huanya Potosi, a journey with stunning views of the surrounding lakes and mountains. The refugio is very homely, and much warmer than we were all expecting! Everyone took Friday afternoon as time to settle in to the lodge and to adapt to a higher altitude. Our first research day took place throughout the day on Saturday, in our pop-up lab within the lodge. This was a very successful day, with many of our volunteers keen to take part in our research and learn new skills! Below are the photos of the lake beside the lodge - a great place to relax between research days. Sunday was a day off for all of us. We decided to trek as a team to the glacier at the base of Huanya Potosi mountain, a hike that took us above the clouds! We have a big update for you all. Over the past few days the organising committee have been hard at work solving the problem with access to our high-altitude accommodation. On arrival in country we were hit with the news that Chacaltaya mountain had had its first proper snowfall in over 20 years. The last time anyone had skied on the mountain had been in the 1990s, and the glacier disappeared completely in 2009. A freak snowy period had led to the access road to the lodge being covered in snow and ice, making it inaccessible by jeep. We attempted to clear the road by bulldozer, however this proved unsuccessful. As always has been, and always will be, the safety of our volunteers is our number one priority. We would never put the safety of our volunteers at risk. 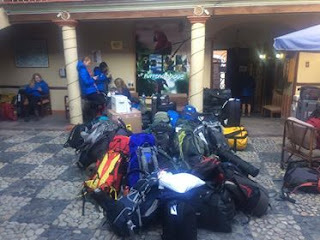 With all volunteers having arrived safe and sound (minus a couple of bags) our team is altogether to start Day 1 of the expedition. Following arrivals throughout the wee hours of the morning, today has been about catching up on sleep, acclimatising to our new altitude (3600m) and getting our bearings around the vibrant city of La Paz. A sea of blue Alpkit jackets has descended on the city and you can't go far without catching site of a fellow team member. Although there is a lot to be done before ascending to Chacaltaya, catching glimpses of the snow topped peaks as you navigate the winding streets have us really excited for the next stage of the expedition. Our team briefing set the scene for the next few days and welcomes everyone to the hostel and surrounding area. The research has begun and the expedition is in full swing. Hola señores y señoritasThe advance party has arrived in La Paz! The four of us, travelling with a total of 12 pieces of luggage, successfully navigated Bolivian customs with some questionable Spanish and lots of big smiles. We reached our final destination at 3am local time, a total of 26 hours after setting off from Edinburgh. Tired yet elated, we decided it was time for some well earned sweet sueños. Feeling the effects of high altitude, we had a good lie in before exploring La Paz and sourcing all of our incountry needs. After buying out two pharmacy's worth of hand sanitiser, we took a brief de-tour up the El Alto cable car, with magnificent views of the city and the surrounding mountainous environment. The beautiful snow-capped Illimani mountain took our breath away. If you ever visit La Paz, this is a must do! (For only 30 pence). 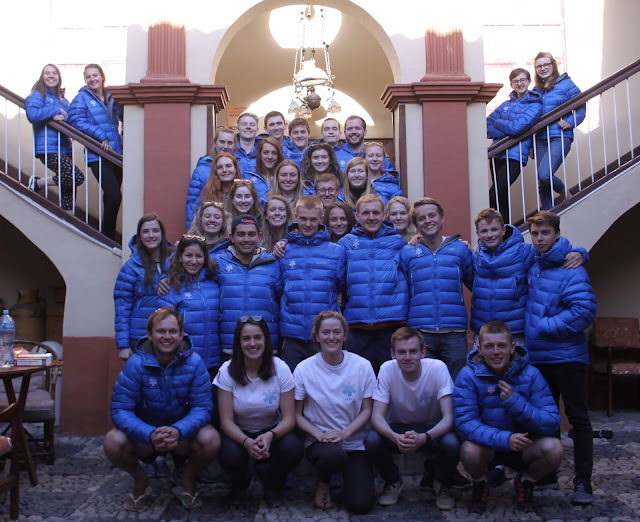 The End of the Beginning In just six days time, 34 students from the University of Edinburgh, accompanied by two expedition doctors, will be travelling to La Paz, Bolivia for the APEX 5 expedition. After two and a half years of planning, this ambitious, student-led medical research expedition is finally coming to fruition. This blog will keep you updated throughout our time in South America, but before that let us tell you a little bit about the journey to now. This is not the end, not even the beginning of the end, but merely the end of a very long beginning. In 2015, six senior medical students came together for the very first time. 28 months later, this team has planned, organised, communicated, overcome and succeeded in their original aim: to continue the APEX legacy.